Apple iPhone X features an entire screen design. This iPhone X introduces the all new Face ID function. Apple introduces the most powerful and brand-new iPhone X that features an entire screen display body. The device has a 5.8inch Super Retina Display. Powered by the A11 Bionic, which is the smartest and powerful chip ever that lets your CPU perform up to 600 billion operations per second. All the more, Face ID adapts to physical changes in your appearance, thanks to machine learning technology. This iPhone X boasts a larger and faster 12MP sensor, deeper pixels, a new color filter, and telephoto camera with OIS. It has an OLED screen with accurate stunning colors, high brightness, and a contrast ratio of 1,000,000 to 1. The space gray iPhone X introduces the all new Face ID function that is the most secure authentication. Your face is now your password. With an iOS11 operating system, this phone lets you experience mind blowing performance. Furthermore, the device comes with an Animoji feature that turns your muscular movements into expressions. It has an internal memory of 256GB that stores all your files and documents at ease. The iPhone X welcomes the future with an all new entire screen design. The device has a 5.8inch Super Retina Display. The perfect teamwork of display and new techniques brings out this incredible phone. It has an OLED screen with accurate stunning colors, high brightness, and a contrast ratio of 1,000,000 to 1. The TrueDepth Camera includes cameras sensors and enables Face ID. This device has a durable glass that is water and dust resistance. Just with a single swipe takes you home from anywhere. 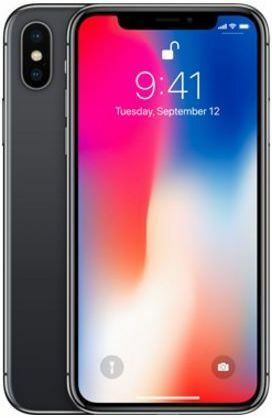 This iPhone X boasts a larger and faster 12MP sensor, deeper pixels, a new color filter, and telephoto camera with OIS. For stunning photos and videos even in low light, both the rear cameras feature optical image stabilization and fast lenses. The excellent teamwork of wide angle zoom and telephoto cameras enable optical zoom and also digital zoom of up to 6x for videos and 10x for photos. 96.9% of users recommend this product to a friend. Original item. It’s been 2 months and still enjoying it. Good price for a iphone with FaceTime, but unfortunately I received one that isn’t installing. So, in the end, high price for this iPhone. I don’t recommend!!!! The face recognition often fails to unlock the phone. Apple needs to improve or replace the hardware or software. THIS IPHONE X WITH fACETIME 256gb IS AWESOME, BUT PRICEY.